D.J. 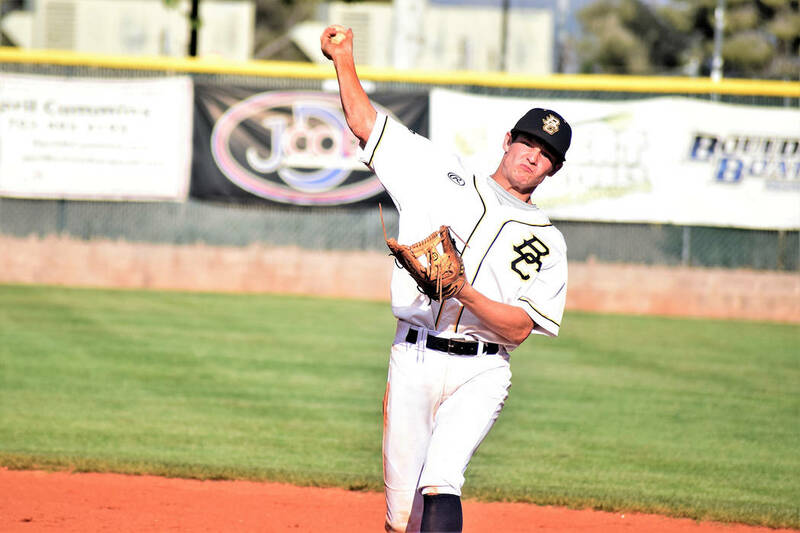 Reese, a senior multisports star at Boulder City High School, earned praise far beyond the local community as he was named one of Southern Nevada’s top 10 student-athletes on April 24. Robert Vendettoli/Boulder City Review D.J. Reese, a senior at Boulder City High School, seen firing a throw to first base to get the runner out in the Eagles' 14-2 victory against Southeast Career Technical Academy on April 25, 2018, was named one of 10 top scholar-athletes by the Nevada Interscholastic Activities Association. Recognized by the Nevada Interscholastic Athletic Association at The Orleans, Reese shared the honor with Elizabeth Bellinger (Palo Verde), Dillon Darrow (Needles), Katherine Dimaya (Silverado), Heather Holman (Eldorado), Kendall Larson (Faith Lutheran), Markell Ludvigson (Virgin Valley), Craig Moore (Pahrump Valley), Bryce Odegard (Pahrump Valley) and Nickolai Zuppas (Palo Verde), praising their hard work and dedication athletically and academically. “This is an outstanding event which recognizes student-athletes who exemplify what high school activities and athletics are all about,” said Donnie Nelson, co-assistant director for the Nevada Interscholastic Activities Association. In addition to an award, the honor comes with a $500 scholarship. Reese has been a key member of two state championship baseball teams, while doubling as an all-state wrestler, placing as the class 3A state runner-up in the 132-pound weight class this winter. As baseball season comes to a close, he is looking for a third consecutive ring on the diamond this spring. Despite earning state championship rings, all-state and all-league accolades throughout his tenure with the Eagles, Reese said this award ranks among his highest achievements. Perhaps working harder than anyone during his tenure with the program, Reese grew up a coaches kid, playing under his father Bobby Reese for his first three high school baseball seasons. Fighting hard to avoid the stigma of favoritism, Reese’s perseverance to not only earn his spot but playing time made him a top athlete with the Eagles as well as in the state. Reese also has been a star in the classroom, ranking seventh in his graduating class of 148 with a weighted 4.56 GPA. Managing to perform community service as well while juggling his busy schedule, Reese serves as the scorekeeper during the freshman volleyball games, while his Boy Scouts of America group painted the dugouts and bleachers at Whalen Field in 2015. The latest in a long line of Eagles to be honored with the achievement since the award began in 1998, Reese joins Brooks Roe (2015), Whitney Barlow, Jana Williams and Samuel Woodbury (2014), Avalon Frantz (2013), Janika Ross (2012), Indiana Mead and Richard Vince (2011), Paxton Fleming and Ryan Honey (2010), Caitlin Forrester and Jeremy Smith (2009), Katie Palmer (2007), Victoria Forrester and Andrew Peters (2006), Mitch Barlow (2005), Courtney Saylors (2004), Lee Hafen (2000) and Melissa Moynihan (1998).